Go to Mammoth Mountain ski area and take a shuttle bus into Devil's Postpile National Monument. Devil's Postpile National Monument features a rather unusual geological phenomenon found in only a number of locations across the globe (e.g. Devil's Tower): previous volcanic activity has resulted in tall, exposed hexagonal basalt columns. 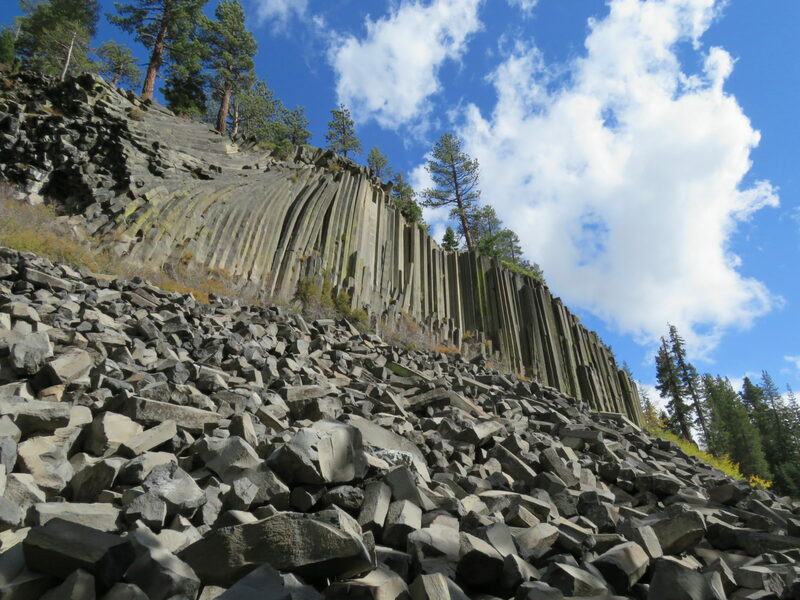 In the case of Devil's Postpile, these columns cling to--and form--a hillside deep in the Sierra Nevada Range. Some, however, have cleaved from the hillside and toppled to the ground, crumbling into large, angular pieces of basalt. At the Monument, one can stand at the bottom of the hill among these angular pieces, looking up--at an extreme angle--at the angular, hexagonal columns still clinging to the hillside.